Whenever I explain Steampunk to the uninitiated I always find that I have to say, “oh yeah, and also…” at least 4 times to try to encompass everything the genre/aesthetic can cover. I can always get them on board when I go from Jules Verne to punking technology, but then I have to back up and include all of the supernatural creatures that also make regular appearances in Steampunk literature and I often get raised eyebrows in response. But if you know the time period, ghosts, ghouls and other things that go bump in the night fit in directly with the trends of the era. Ghost stories appear in the folklore of countries all over the world, but ghosts as we think of them today in America and the UK where the majority of Steampunk stories occur have their roots in Spiritualism. Some people treated Spiritualism like a religion, and others viewed it more as a science but either way it is based on the belief that spirits are hanging around waiting to have conversations with the living, and they do so by knocking on tables, moving around objects, and occasionally even taking mediums clothes off. They speak through people who claim a supernatural ability or through the use of hypnotized volunteers (and very rarely say “wooooOOOOoooo”). I learned most of what I know about the Spiritualist movement from a wonderful and funny book by my favorite non-fiction writer and former Wired magazine columnist, Mary Roach. She has written several books worth reading, but for the skinny on communicating (or pretending to communicate) with the dead, you must read Spook: Science Tackles the Afterlife. Many notable historical Brits like Sir Arthur Conan Doyle and Queen Vicky herself were taken in by the “evidence” of spirits among us. But, most folks point to a happening in New York in 1848 where two sisters supposedly contacted a ghost as the beginning. Four years later, mediums started popping up in England and conducting seances. By the late Victorian period many people claimed to have communicated with the dead, and women dominated the medium business. In a time when class division and a clearly patriarchal society predominated, Spiritualism was movement that crossed these boundaries and brought people from all walks of life into its fold. 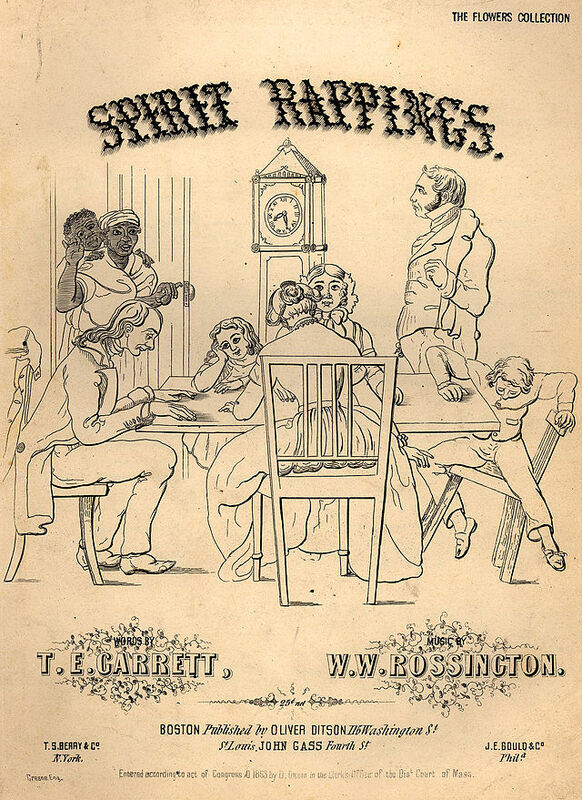 There were even pamphlets, newspapers and public spectacles for the spiritually-inclined during the 1860s. Ever heard of ectoplasm? Think of the goo left behind by Slimer from the Ghostbusters. Some folks believed that ghosts could leave a trail of the stuff, or that mediums would extrude it as evidence of spirit possession. Ewwwwww. For more fun facts about this “spirited” movement, check out the articles on Victoria Web. This entry was posted on October 21, 2014 by Phoebe Darqueling. It was filed under History, Scholarship, Editorials and Opinions and was tagged with ghosts, halloween, Queen Victoria, Sir Arthur Conan Doyle, spirits, steam punk, Steampunk, Victorian era. And if I might add: nothing beats Dion Fortune’s oevre to understand the movement.